Below are just a few of the "Thank You" emails we have received from our clients. The Villa Getaways experience was absolute paradise! The estates were pure luxury with some of the most incredible views I've ever seen. Throughout the trip Villa Getaways went above and beyond to make our experience one-of-a-kind! We went island hopping, yachting and snorkeling in crystal blue water as far as the eye can see. 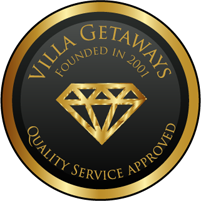 I highly recommend Villa Getaways and the experiences they are able to provide". Where do I start with my praise for Villa 1, Eric, Khun Boot and the staff? I feel that I cannot do them justice. The moment I arrived at the front gate of the complex and was refused entry until my identity was validated I felt a sense of safety and security and I knew that I had picked the right property for us. Whilst very courteous, the security staff were rigorous with their procedures and I welcomed that - a job well done. The Villa complex is stunningly beautiful. 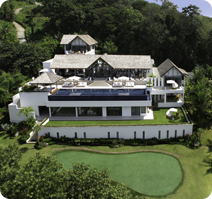 The design of the hard and soft landscaping on the approach to villa 1 hinted that something magical lay beyond and yes, there was, behind that beautiful antique blue door was Khun Boot and her staff, warm welcoming smiles, cool towels and drinks. It literally was like entering another world. One of safety security peace, tranquillity, relaxation, ..... I could go on but I'm sure you have heard it all before. The villa was simply magnificent. Fixtures, fittings, furniture, antiquities everything was just beautiful and exceeded expectations. Khun Boot - the most delightful hostess I have ever encountered. Her warmth, quiet efficiency, delicate manner, beauty, style and tactful guidance on what would best suit our needs made this our best holiday ever. She anticipated our every need and was always on hand to fulfil them. Under her discrete guidance the staff were present but unobtrusive. The chef and food were superb. Everything she touched became a feast for the body & soul. We all had difficulty dressing to leave, our clothes were too tight! Eric what a fabulous man - he came especially to wish my husband Happy Birthday and brought us the best birthday cake ever - ice cream. Kris I could go on and on but I am left with a dilemma, should I tell everyone how fabulous it was and have them rush to book it and make it unavailable for us or should we sell everything we own, try and buy it and Khun Boot and keep it to ourselves? Thank you so much we had the most wonderful time in our own little magical kingdom, made some very happy memories and look forward to returning. Just to tell you that we had very very very nice time in Seychelles. The villa is incredible, elegant and perfect as the people who work in it. We spent beautyful days, so beautyful that my friends bought a land in Mahe. The manager Karl and his wife are perfect and they speak fluently Italian. I hope to use your agency again. Thank you to introduce us the Seychelles villa. Best regards and ciao. Have just returned to Dubai where I will be in town for the next couple of days. The Villa was fantastic, staff outstanding and we hope to do it all again next year. Look forward in hearing from you. The place is fantastic. Having a great time. Didn't realize it was like 50 feet from the place we stayed in last year. Thanks again for everything. The staff is terrific at villa 4152. The property manager, and folks here are absolutely fantastic, taking good care of us. Awesome awesome awesome! Thanks again. Great all around. Tough to leave. On behalf of the four of us that travelled to Koh Samui recently, I just wanted to say a HUGE thank you to you for organizing our villa accommodation. Villa 468 was really nice and just as the photos depicted, so we were all very happy there, but the alternative accommodation you organized (villa 408) was absolutely outstanding! We had the most amazing time there and the staff were fantastic as was the food. We will definitely be returning again, in fact we are already talking about a trip next year to that same villa! You have been an absolute pleasure to deal with and when the problem of the double booking arose you went out of your way to compensate with Villa 408 which as it turns out was the highlight of our trip. I will definitely be recommending your services to friends and family. I would like to commend Madhavi for a WONDERFUL job! From the first email followed by MANY more, Madhavi has ALWAYS been friendly, quick to respond, patient, good follow-up plus an overall complete willingness to help and accommodate! This was all accomplished via email! Through technology, Madhavi was able to express her warmth and professionalism. I can’t tell you how many times our travel plans, # of travelers and traveler needs have changed (NUMEROUS!) and through it all Madhavi has been patient and EXTREMELY HELPFUL! Villa Getaways has my business today SOLELY because of Madhavi. We all live & work in a competitive market place and the world seems to be getting smaller; it is SINCERE HEART FELT Customer Service that sets businesses apart. 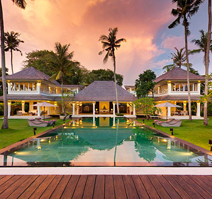 You were the first website we looked at (and I must say, your website it welcoming & easy to navigate), but honestly after we found you, we realized there are hundreds of villa rental agencies. However, in the end, the first shall be last and because of Madhavi, Villa Getaways became the one and only for us. G. S., 1440 Trading Inc. This is what we hoped for. Spacious, tranquility and luxury. Villa 379 has it all. Beautiful architecture and a balanced interior. Thanks to the outstanding care of Alit and Made and the ‘exquisite’ and excellent cooking of Komang, our stay in Villa 379 was very comfortable and unforgettable. 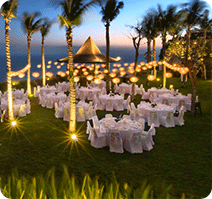 This was a very special way to experience the beauty and the hospitality of Bali. Kris-sorry for the late reply but once I was back form vacation then work started right away. A sincere thank you for a fantastic vacation. Both of the Villas were great, as well as the staff, food, service, etc. We had an amazing time and are already looking forward to a future booking. 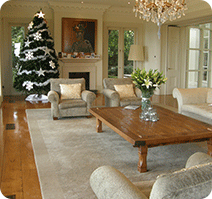 I will be in touch with you in the future as personal or corporate Villas are needed. We usually do a large retreat (really a vacation) for all of our employees each year and have always rented private villas in the past. Now we have been having a difficult time finding large enough estates to accommodate everyone but I will let you know when the time comes. Not to mention that I need a personal vacation (again) already!